stickboybike: Bike time for all. I just go an email from my Viner rep today. I am known by some as being an enthusiastic fellow. Maybe sometimes passionate regarding my job and the work I represent. (old job and new) When I opened my attached file, my reaction was something like, Oh my gosh that bike F#$#ing rocks. Now that I have had some time to mentally chew on that. I think that the fact that the bike has orange on it my have flared that reaction. From what I can tell this is Viner's new Carbon weapon. I will have new details on material origin...Deda? This coming seasons kits will be cut and dry. 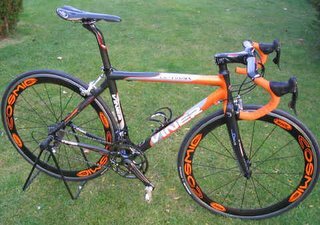 Dura-Ace, Ultegra, Record or Chorus. That's all you need for an Italian steed. Preferably Campy...ha! Black Friday was good at the shop. We are still catering to more women that guys. My Nideckers that came Wednesday were gone by Sunday. Yea baby! Ski Roundtop may open by next Monday, weather permitting. I have my rail board ready with a fresh coat of brown krylon paint. Mustard yellow Drake bindings and a 2.5 degree bevel on the edges to save my face from the steel. I am glad that the carbon fiber that is used in the boards on the floor haven't increased in price like the bike dept for next season. Materials inflation? Maybe the bikes should be made of poplar, tri-axial fiberglass and rockwell 48 steel? Steel, mmm I like that on my bike! Speaking of bike, my Masi rep dropped off a fresh set of Conti 4000 for my ride. I will be sure to test them when the warm snap comes. Oh crap that was this week. Christmas lights took priority.